You are here: Home / Blog / What is Leader's Permission? Learn more about the considerations and functionality of Leader’s Permission, both as a leader and a participant. 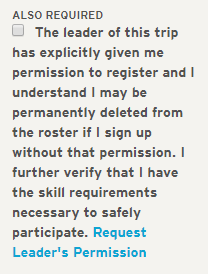 Some of the trips and activities on The Mountaineers website are posted with a condition called Leader’s Permission. On these trips, all participants, assistant leaders, and instructors must seek the primary leader’s permission to register on the website. When Leader’s Permission is required, there is an additional check-box on the right hand side of the registration page, just below the listed prerequisites. This registration restriction exists so that leaders have the opportunity to verify that each participant is truly qualified to attend their activity. There are a wide variety of factors that go into activity planning, and in many cases, leaders want the ability to have a conversation with every prospective participant to learn more about their goals, interests, and previous trip history. 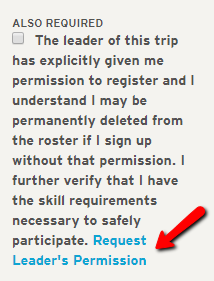 Leaders need to know that they are not putting the group at risk by allowing someone who does not have the appropriate experience, skill, or conditioning to join the activity- and the Leader’s Permission functionality allows for that additional layer of dialogue between the leader and participants. If a participant checks the Leader’s Permission box without receiving approval to join the activity, leaders may remove the individual from their roster. In the past, this process has caused some tension and disappointment for both participants and leaders. Please observe the following points to eliminate any miscommunication! Our leaders have a variety of reasons for using the Leader’s Permission function. Please only check the box to register if you have received explicit permission to join the roster! Unless otherwise stated, this also applies to instructors and assistant leaders. If you need to request permission, please use the blue link included in the text box to send a message directly to the leader. If you register yourself without receiving the leader’s permission, you are taking a spot on the roster, preventing another participant who did reach out to the leader from registering. This creates an additional step for the leader to remove you and add the other person. It is the participant’s responsibility to contact the leader for permission, and the leader has every right to cancel a participant from his or her roster if they do not follow instructions. Please keep in mind that all of our leaders are volunteers, giving their time willingly to help our members get outside. Give them a little time to reply to your message, and help them out by providing all relevant information about your experience with the related activity! If you still do not hear back, please reach out to Member Services for additional support. People make mistakes, and there will be times when you have to cancel someone from your roster because they failed to seek permission before registering for your activity. When you do have to cancel someone from your roster for this reason, be kind and considerate, and help that member understand why Leader’s Permission was required for your activity. The more we can reinforce a culture of safety and proper preparation in advance of an activity, the more we can all have a great experience together in the outdoors. If there is still space on your roster, ask the individual to send the information that you want in advance of the activity. Assume positive intention, and give them another opportunity to join your activity! They may simply have been unfamiliar with Leader’s Permission, or something was lost in translation along the way. As a leader, you can also help by writing a great activity listing and clearly explaining the information that you’d like to receive from participants in the Leader’s Notes section of your activity listing. This will help people to self-evaluate whether or not they are properly qualified to participate in your activity, and reinforce the Leader’s Permission function. Unsure of what kinds of questions to ask? Check out our blog about Screening Participants for Safety! If you are concerned about participants signing up without permission, we do have an email alert system to let you know when someone signs up on your roster. To use this functionality, simply go to your activity listing, and click “Edit” in the orange admin bar, and scroll down to the blue “Registration” header and check the box to notify leader of all registration changes. Want to add Leader’s Permission to your trip? Please click "Edit" in the orange admin bar and scroll down to the blue “Registration” header. Towards the bottom of this section, you will see a question prompting you to choose whether or not you'd like to select Leader's Permission. Make it clear in the disclaimer that leader permission shall never be assumed, meaning just because the participant knows the leader, maybe even participated on previous trips, this does not substitute for direct permission for any given trip. Make it possible for the participant to easily contact the leader at the permission check-box feature. Do include the email notice to the leader upon sign ups. Do include a feature that alerts the participant who has been cancelled due to not having gained leader permission. Be sure this alert provides a way to contact the leader by phone and email. I prefer phone in most cases. Since launch, we've now added a link right on this part of the activity where participants can "request leader permission." This opens up a form that they fill out that sends an email to the Leader and streamlines the process for requesting permission. Making it easier to ask for permission, and grant it, should reduce the number of situations where participants are not matched with a trip that meets their expectations. Let us know if you have any problems with this functionality.